The first page of a journal is always so tough for me. It feels monumental, the beginning of the theme of the whole journal, the first stroke of an era! A few years ago, I would stare at this page for weeks before I would finally get the nerve to make the first mark. While I still get nervous about that first page, I have developed an intricate plan to get past this anxiety. And I will share my secret with you! My big intricate plan? Skip the first page! Go to the next page and start your bullet journal like you normally would. Once you sidestep the blank page, it will suddenly have less power over you. 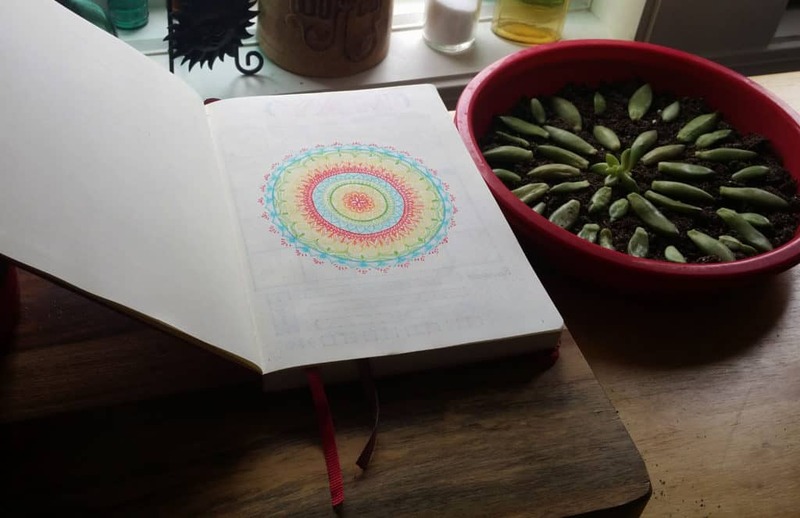 Instead of putting your bullet journal on hold and waiting for the perfect drawing or quote or heading, come back to it when you have had time to noodle on it. That way life can go on AND you won’t feel the pressure to get it just right. You don’t have to do anything on that page ever if you don’t want to. Or you can draw something out in pencil and ink it in later when you’ve settled on it. Or use it to scribble random notes, it doesn’t matter. The point is to finish it, not make it perfect. 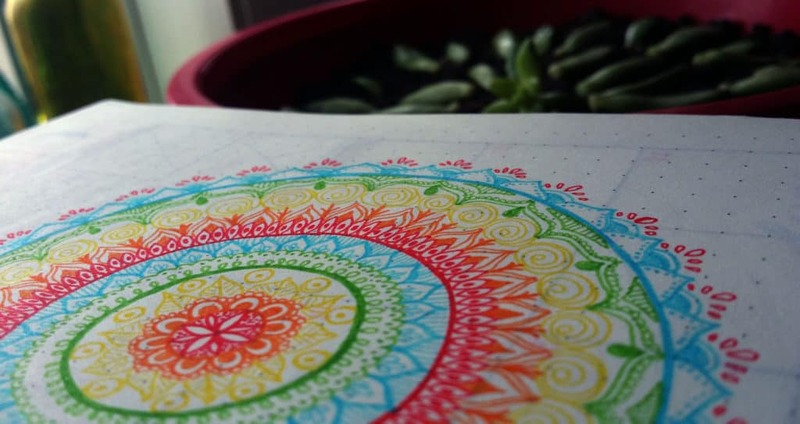 I like drawing mandalas on the first page. I like a ritual if I am just starting the journal, and spending a couple of hours on an intricate design feels like an appropriate ceremony. I love zoning out while drawing out the design and listening to Prime Music, which is full of great working/meditation/spa music to help you zero in on the task at hand. If you’re feeling nervous about working, try it out for free for one month (or six if you’re a student!) and see if it doesn’t help you with that first page. Using multiple colors really helped draw me in and feel like I was doing something special. I would highly suggest the Staedtler Triplus Fineliners for the variety of color and the teeny fine lines, which are great for these intricate designs. If you’d prefer black, maybe look into some Micron pens. You can get a variety of line widths and have a reliable, bold black pen set. Win-win! But sometimes, I just don’t have a couple of hours and I want to get stuff done. So I just come back to it and do my official ceremony at a later date. That’s what I’ve done with my Leuchturm here. 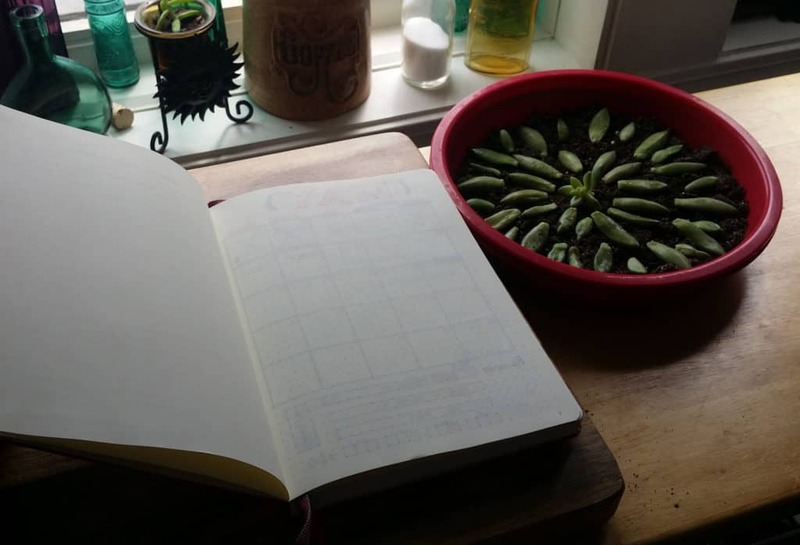 When I first cracked open the notebook, I wanted to get right into building my monthly spread and planning important life stuff, so I did just that. As long as I get around to filling in the first page when it’s still a relatively new journal, I’m happy. 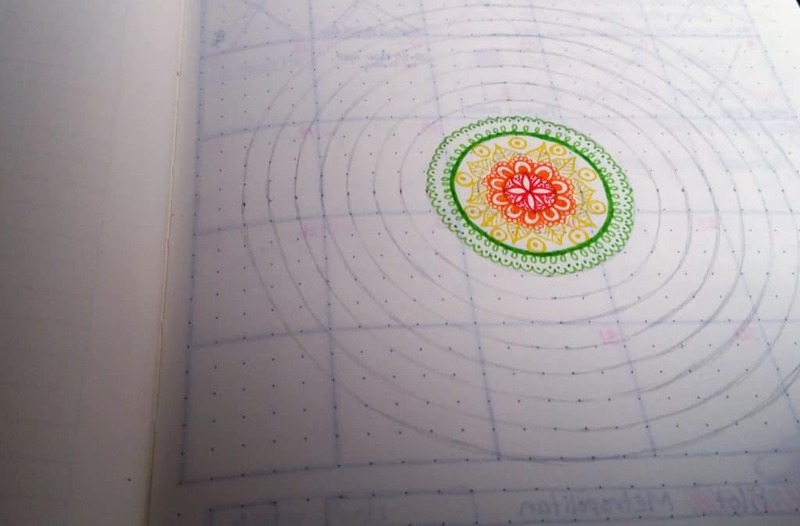 To take away some of the fear of screwing up, I draw my mandala in pencil first with a grid of circles and add the pen later. If you are using a dot grid notebook, like the Leuchtturm1917, my circles are one row of dots wide. If you are using anything else, I would suggest the use of a circular object like a cup or using a compass. After all the pencil is done, I just ink the design and I have myself a first page, no stress! I still haven’t decided whether I want to add a quote or just leave the mandala as it is. One day later I might run across an amazing quote that must go here, but until then, I’m content with this. An affirmation, like “I grow more organized every day” or “I am the best version of myself”. You could come up with any number of things to use as an affirmation. So there you have it! My magical technique for getting past that first page fear is to just forget it and move on. The first page will not define the tone of the rest of the journal, and you likely will not look at it much – if ever. Everything will be okay as long as you remember to breathe! I’m happy to see that other people struggle with the same thing like I do. I have 17!! Journals because I can’t pass a beautiful one without buying it 🙂 now I have more ideas to use them. Thank you for sharing. There is definitely something about a beautiful journal that pulls you in! Glad you have some idea to start putting them to use now. This is a great post! So helpful! Can you tell me about your succulent? Do you just pull the plant apart and lay them on soil? I have never seen such a thing! Do you have a link for me to learn more about this? Does it regrow and make a big succulent flower? Thanks for sharing your bullet journaling tips! This is great stuff! I have never heard of this before and I think this is exactly what I am looking for! I am getting myself a journal and starting right away! Thanks for such great detail! I’m glad you liked it, Eddie!